I’ve decided to tackle three or four substantial nonfiction books, over the next few weeks, in the manner of reading books for college courses — that is, alternating among them over a quarter or semester-like period of 8 to 10 weeks. Pinker’s book, posted yesterday, is one; Robert Wright’s book begun here is the second. At least two more are planned, to all be done by, say, end of November at the latest. 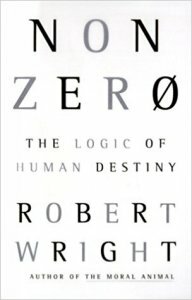 This book is Nonzero: The Logic of Human Destiny, by Robert Wright, published in 2000. Wright wrote one of the best early books about evolutionary psychology –- The Moral Animal, in 1994 — that brilliantly illustrated the principles of how evolution has shaped human nature, through the events of Charles Darwin’s own life. Since then he’s gone in curious directions for a journalist who understands and appreciates science; after this 2000 book he went to to write The Evolution of God in 2009, and just published a new book last month, Why Buddhism Is True. The latter book isn’t about Buddhism supernatural claims, but rather its view of the human condition, which apparently Wright thinks has been validated by evolutionary psychology. The present book, Nonzero, discusses how progress in human history exists; it’s not a zero-sum game. My initial reaction: beware! It is the easiest thing, given human nature, for humans to perceive order and purpose where there is none, especially if such order and purpose privileges the perceiver. (I’m special!) The past two decades has seen much psychological research and conclusions about the biases of the human mind that would enable such conclusions. So I go in to this book skeptical. But it’s good and necessary to occasionally sample books (and claims of any kind) that challenge one’s provisional conclusions. Let’s see what he has to say. DNA was one kind of secret of life, but perhaps so was the idea of “zero-sum” games vs. “non-zero-sum” games, as described by John von Neumann and Oskar Morgenstern, the founders of game theory. Games like tennis or chess are the former – for one to win, the other must lose — while activities like saving Apollo 13, and many kinds of trade, can be the latter, where both, or all, sides can win. And he anticipates a new era of relative stability, even with a lot of “wiggle room” about the degrees of freedom or privacy that stability might entail, another purpose of this book. This scale was unveiled in 1877 by Lewis Henry Morgan. Marx and Engels embraced his book. Such forces of history were also held by sociologist Hebert Spencer, who loathed Marxism; John Stuart Mill also endorsed these ideas. In the mid 20th century this conventional wisdom changed; the idea of ‘ranking’ cultures came to be seen as unsavory. Franz Boas; Margaret Mead. After WWII, Isaiah Berlin and Karl Popper attacked such theories. The idea of ‘metahistory’ lasted until Francis Fukuyama’s The End of History (1992) [which, post Wright’s book, was undermined by 9/11 and the rise of Islamic terrorism]. Author plans to argue that Popper, Berlin, and Boas were wrong. Oddly, anthropology is more sympathetic to ideas of cultural evolutionism. Because its observations of older societies being more primitive, simpler. This is up to page 17. This entry was posted in Evolution, Human Progress, Robert Wright. Bookmark the permalink.